They say, the best things in life are meant to be shared especially when they’re as delicious as TGIFriday’s Christmas shareable flavors. TGIFriday’s, world famous restaurant for their great food serve in generous servings and a good place for amazing drinks, brings you another round of shareable platters this holiday season. I was one lucky earthling to sample two of their sumptuous offering this year and believe me, you’ll never grieve over the money you’ll spend for this and everything on the platter is worth every penny. 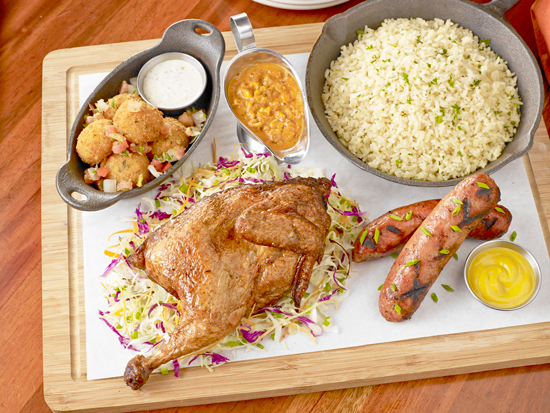 The “Smokehouse Platter” comes with four delicious food items – The smoked and seared Fried Chicken served with a good helping of jambalaya sauce to compliment the chicken made every bite ooze with a delightful combo of sweet and smokey taste. The Char-grilled and meaty sausages, which is so flavorfully filling, served along with a generous serving of rice pilaf and a plateful of Golden Chipotle Cheese Balls complete the meal like no other. The “Jack Daniel’s Platter” is my personal favorite and the best way to go. This platter that comes with a delightful fall-off-the-bone ribs, basted with Jack Daniel’s paired with a sought-after sauce served with fresh corns on the cob is definitely a table bomb. Just the way ribs should be, so good. The plate also thought of peeps who’s partial to chicken. The half chicken glazed with rich Jack Daniel signature sauce, topped with sesame seeds and pickled red onions is one dish to sink your teeth in and revel on. The platter also comes with rice pilaf and a plate of Golden Chipotle Cheese Balls to complete the meal. All two platters serve three persons. So if you’re craving for something ‘so much’ in your plate, you don’t have to wait ‘till Friday to indulge. 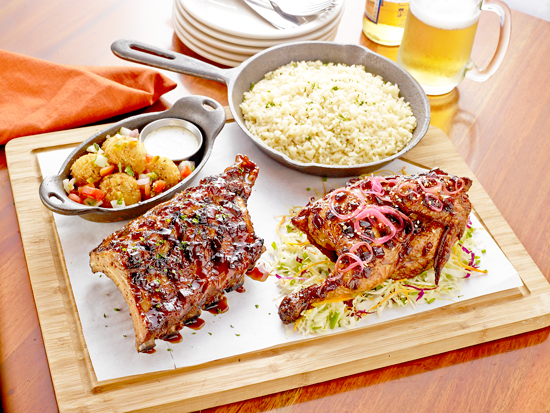 These two platters of shareable goodness are now available for taking at TGIFridays Abreeza Ayala Mall branch here in Davao. That looks so yummy Ate Verns! Merry Christmas!